I remember going to play basketball with my friends Milton and Dwayne, we the "Three Musketeers," our heroes with names like Magic Johnson and Kareem Abdul Jabbar fresh on our young minds. Racing across a rocky parking lot with broken glass, I managed to trip over my fourteen-year-old Pro-Keds donned feet, tumbling head over heels and scraping my back of skin from my left hip to midway my right shoulder. Pain like that - white hot like a poker from a fire - is not easily forgotten. My friends took me back to my mother, who they knew was a nurse. After cleaning me with mild soap and Hydrogen Peroxide, she applied something called "new skin." It stung worse than the injury, but it sealed my back while it slowly healed. I wore loose shirts and had for a moment "street creds" (quite literally, since pieces of the street skid-marked in my back caused my dilemma). This is obviously a lot better than new skin, as the application extends beyond the epidural. Hopefully this application is not as painful to future clumsy teens, and that there's a mother with bandages and brownies for their troubles. If there's such a thing as an experiment that goes too well, a recent effort in the lab of Stanford chemical engineering Professor Zhenan Bao might fit the bill. 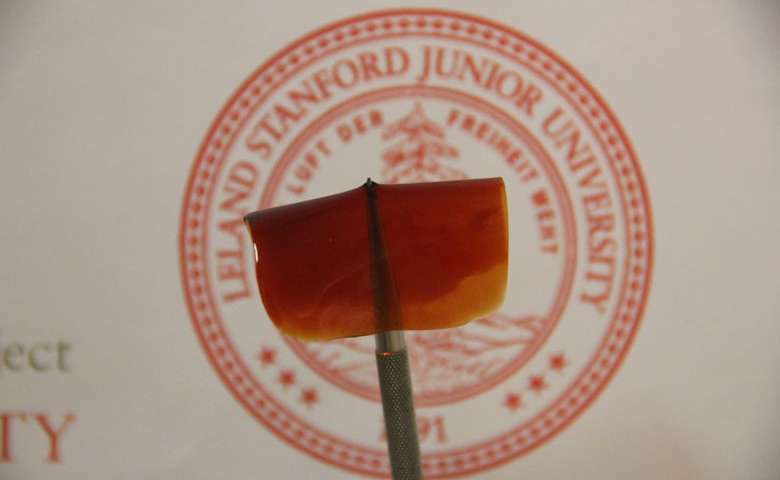 One of her team members, Cheng-Hui Li, wanted to test the stretchiness of a rubberlike type of plastic known as an elastomer that he had just synthesized. Such materials can normally be stretched two or three times their original length and spring back to original size. One common stress test involves stretching an elastomer beyond this point until it snaps. But Li, a visiting scholar from China, hit a snag: The clamping machine typically used to measure elasticity could only stretch about 45 inches. To find the breaking point of their one-inch sample, Li and another lab member had to hold opposing ends in their hands, standing further and further apart, eventually stretching a 1-inch polymer film to more than 100 inches. "I said, 'How can that be possible? Are you sure?'" she recalled. Today in Nature Chemistry, the researchers explain how they made this super-stretchy substance. 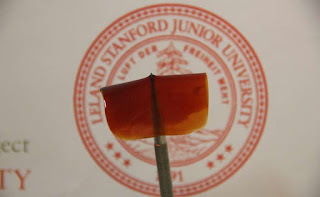 They also showed that they could make this new elastomer twitch by exposing it to an electric field, causing it to expand and contract, making it potentially useful as an artificial muscle.